Late July into August is when peaches taste as they should — no more buying them hard as rocks and waiting for them to ripen into mush! Look for locally grown (and organic) peaches, if at all possible. They should have a little give when you press them. Aside from eating out of hand, consider some of these fresh peach recipes for your summer pleasure. By the way — any recipe that calls for peaches is just as good with nectarines as long as you remember the ideal trio: local, organic, and ripe. Summer Tomato and Peach Salad: This late summer salad, shown at top, is perfect for using ripe tomatoes and peaches of the garden or farm market variety— not the kind that come with stickers on them! Fresh local tomatoes and peaches seem to reach their peak of flavor at the same time, and are a surprisingly compatible duo. Walnuts or pecans add a surprising twist to this easy salad. 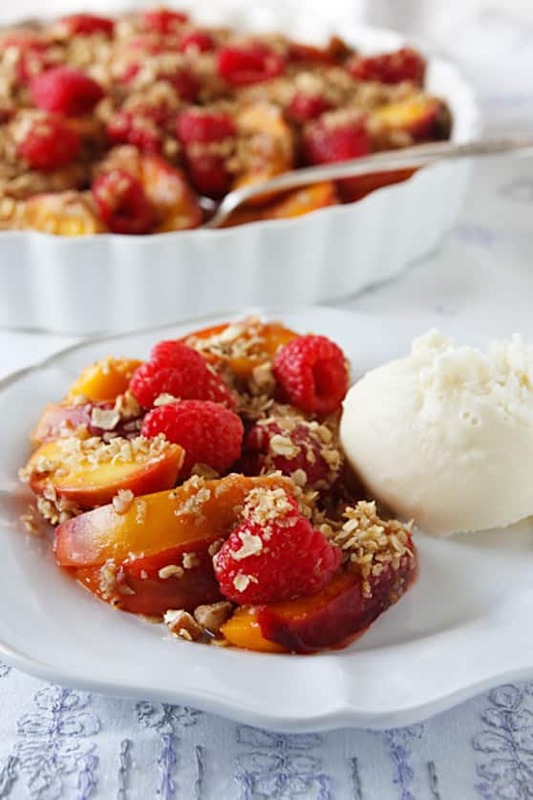 Unbaked Peach-Berry Crumble: When you want a lovely summer dessert but don’t feel like fussing (or baking) this unbaked peach-berry crumble just the thing. I particularly like this with raspberries, if they’re available. 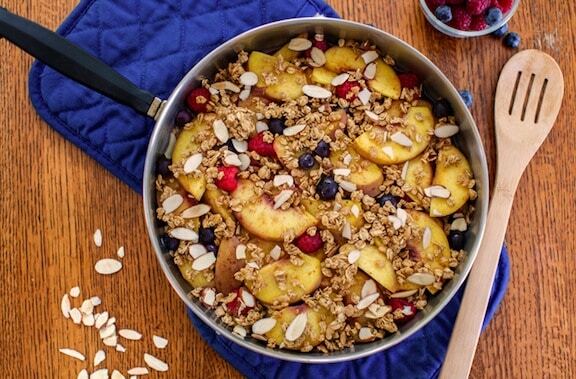 Skillet Peach Crisp: Rock-hard peaches that have traveled a great distance never seem to develop much flavor as they ripen, and often go to mush. They’re not welcome in this quick dessert can be enjoyed shortly after you make it — no baking or chilling required! 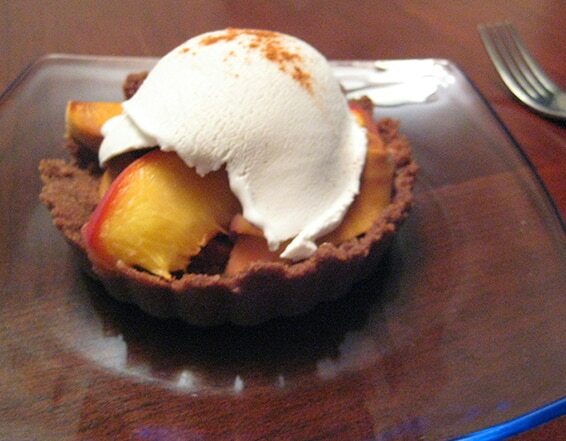 Gluten-Free Peach Pie: Leslie Cerier’s GF peach pie is fun and easy to make. For a light-colored piecrust use ivory teff flour; for a chocolate-brown piecrust use brown teff flour. Both are equally scrumptious and both are available at natural foods stores to make great gluten-free pie crust and other baked goods. 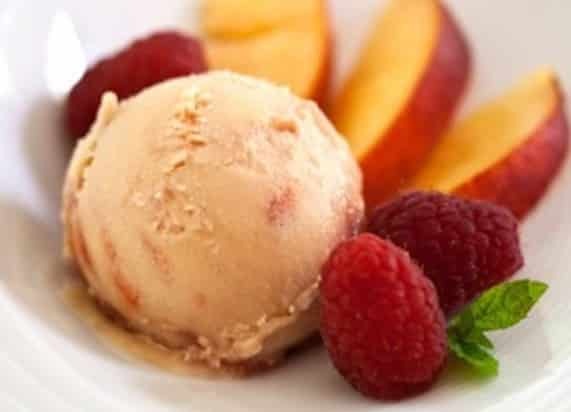 Peach Melba Ice Cream: Hannah Kaminsky was inspired by the original 19th century dessert to create this updated vegan peach melba ice cream. It becomes a much easier make-ahead dessert that merely needs to be scooped and served. 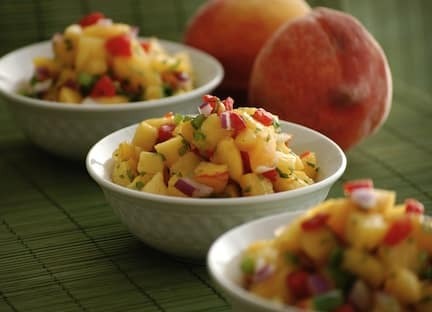 Cherry Tomato and Peach Salsa: Homemade salsa tends to get watery from the tomatoes’ juices, but I discovered that using cherry (or grape) tomatoes helps mitigate that. And there’s no pre-chopping — just toss them into the food processor whole. 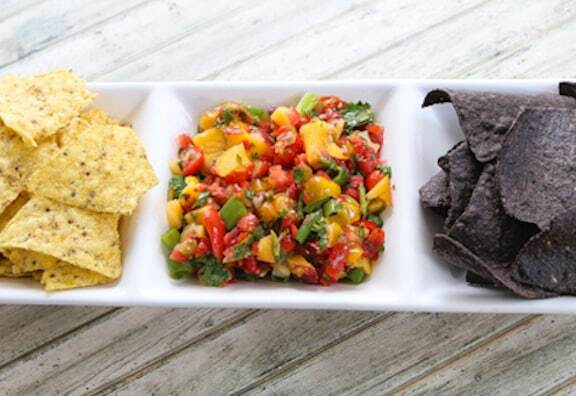 Adding a ripe peach gives the salsa a perfect sweet twist. 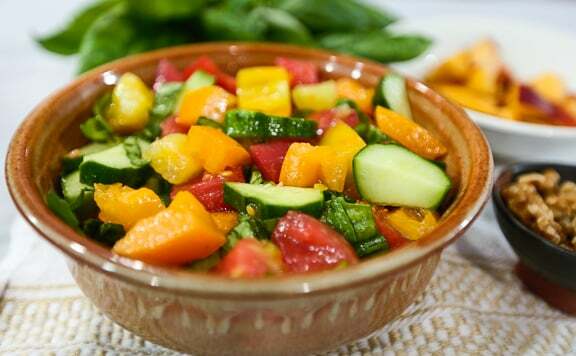 Peach Salsa: In Sandra Gutierrez’s new spin on a classic, peaches replace tomatoes, and the result is a healthy, colorful, and refreshing salsa. This peachy take on traditional pico de gallo will satisfy your cravings for sweet, sour, and spicy flavors. Fresh Peach Chutney: Lots of chutneys are cooked down, but why go there? 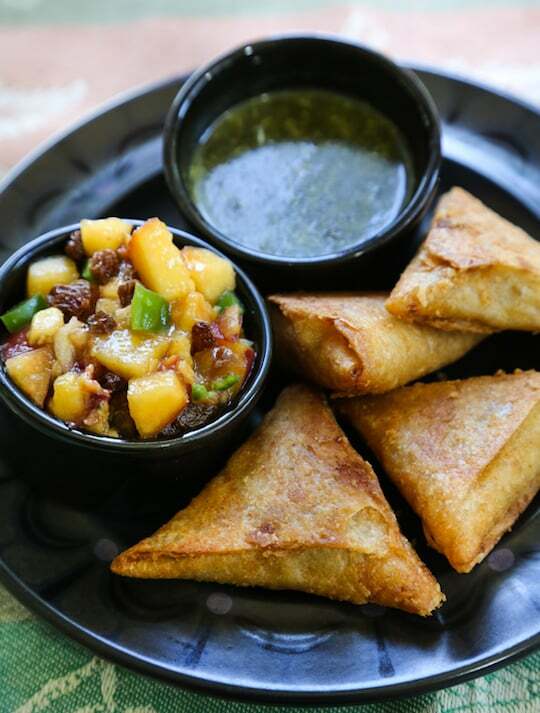 This combination of fresh fruit (nectarines are just as good here as peaches) and chile peppers strikes just the right balance of sweet and spicy, making a fantastic relish to serve alongside grilled vegetables, curries, and samosas. 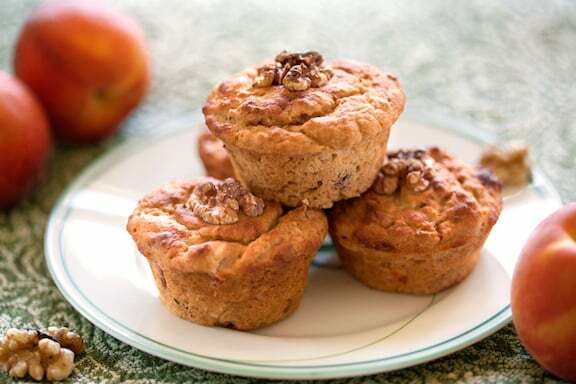 Gingery Peach Muffins: Use perfectly ripe fruit—lush and sweet, but not too soft—for these late-summer vegan peach muffins that have more than a hint of ginger! Nectarines work just as well. Enjoy them with iced coffee or tea. 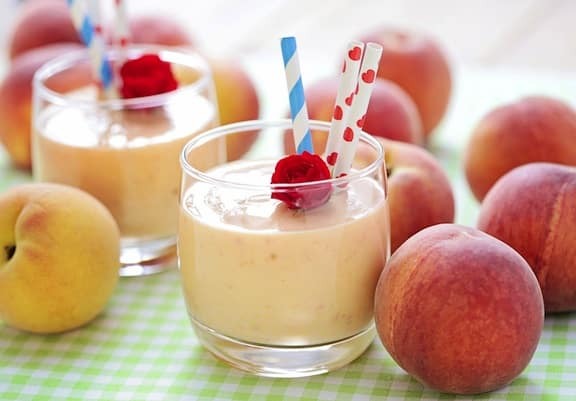 Peaches and “Cream” Smoothie: Here’s a filling peach smoothie with a subtle, mellow flavor from coconut yogurt. Use only lush, ripe summer peaches or nectarines for this refreshing treat. Enjoy these fresh peach recipes — what are some of your favorites? Thank you for sharing all these cool vegan summer recipes Jordan.